Yes! Exactly! That’s why we’re trying to figure out new media for expressing, learning, and talking about computing. He exhorted graduates in biological physics; chemistry; computational linguistics; computer science; language and linguistics; mathematics and physics to find new modes of communication. I suspect that the problem described in this Guardian article is exactly what’s happening with our Computational Media degree program. The BS in CM at Georgia Tech is now 47% female, while the BS in CS is only 20% female. CM may be perceived as front-end and CS as back-end. Liberal arts colleges explore interdisciplinary pathways with CS: Great to see! I’m excited by this initiative. We need to see more CS + X kinds of programs. Our Computational Media degree program has been a Computing + Digital Media program, and is wildly successful (see example post here). The challenge is to engage faculty from across campus in the initiative. Bates last September launched a similar project, called the Digital Course Design/Redesign Initiative, for faculty members interested in adding digital and computational tools or methods to existing courses. If it becomes popular among faculty members, the initiative could help realize Bates’s plans of having interdisciplinary pathways for its digital and computational studies majors. Auer, the Bates dean, acknowledged that building those pathways is “going to require deep consultation with the faculty” — as well as some new faculty members in other departments. I recently moved offices. 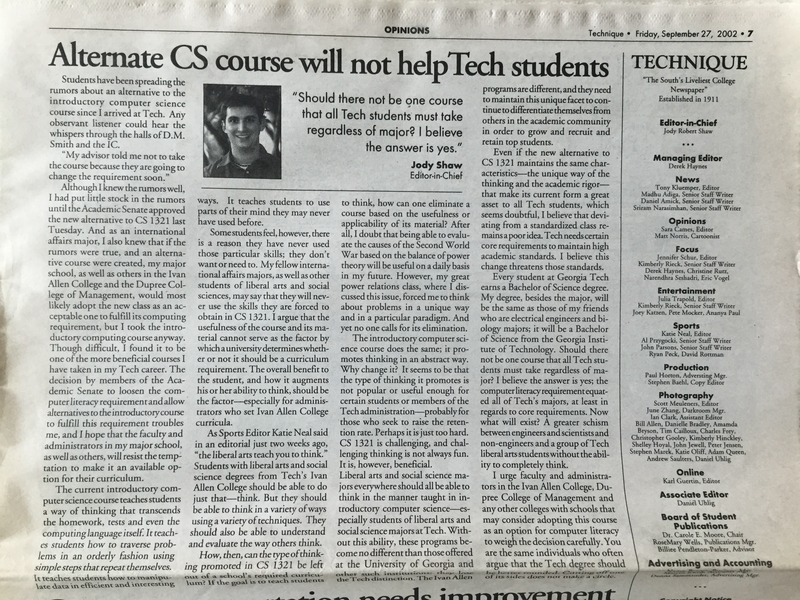 In the process of packing and pitching, I found the above editorial from the Georgia Tech student newspaper. Dated September 2002, it urged the faculty in the Liberal Arts, Architecture, and Management Colleges to reject the newfangled Media Computation class that was being proposed. That phrase “CS lite” gets applied to our BS in Computational Media regularly. (See the blog post where I talk about that.) Which is funny, because all but one of the CS classes that CM majors take are the same ones that CS majors take. Georgia Tech CS majors take many more credit hours than other majors (including CS majors at other institutions), and the CM major has enough CS courses to be ABET accredited as a computing program. So, what’s “lite” about that? Are other schools’ BS in CS programs “Georgia Tech CS lite” because they have fewer credit hours in CS? Media Computation wasn’t lite. It was different. MediaComp didn’t cover everything that the intro course for CS majors did. But the course for CS majors didn’t cover everything that MediaComp did. In fact, after a few years, the CS instructors complained that our CS majors didn’t know about RGB and how to implement photo effects (like how to negate an image, or how to generate grayscale from a color picture) — which non-CS majors did know! Content on media got added to the CS majors classes. Computational Media isn’t CS lite. It’s CS different. The one course that’s different between CS and CM is the required course on computer organization. CS majors take a course based on Patt and Patel’s book. CM majors take a course where they program a Nintendo Gameboy. The courses are not exactly the same, but have a significant overlap. We did a study of the two courses a few years ago and published a journal paper on it (see link here, and article is on my papers page). There was no significant difference in student learning between the two courses. But the CM majors liked their course much more. Now, there are projects on programming the Gameboy in the CS majors classes, too. Different is good. Different is where you invent new things. Some of those new curricular ideas helped CS courses. Some of those different ideas stayed in the CM and MediaComp courses. Those courses serve different populations and different needs. Not all of it was appropriate or useful for CS majors. I’m an advisor on the EarSketch project, and it’s really cool. Recommended. Next month, the EarSketch team will be offering a workshop at SIGCSE in Kansas City. This is a great opportunity to learn more about EarSketch, get hands on experience with the curriculum and environment, and learn how to use EarSketch in your classroom. This year’s workshop will also offer advice on integrating EarSketch into Computer Science Principles courses, though the workshop is of relevance to anyone teaching an introductory computing course. Please contact Jason Freeman (jason.freeman@gatech.edu) with any questions. Library & Information Science Department Guest Lecture, open to the Rutgers Community…. Abstract: Efforts in the US to promote learning about computer science and computational thinking emphasize the vocational benefits. Research on end-user programming suggests that for every professional software developer in the United States, there are four more professionals who program as part of doing their job. Efforts in other countries (UK, Denmark, New Zealand) instead emphasize the value of computing as a rigorous discipline providing insight into our world. We offer a third motivation: computing as a powerful medium for creative expression. We have used computational media to motivate children to study computing, to go beyond thinking about “geeks” in computing. We use media computation to encourage teachers and introductory students at college. The approach draws in a different audience than we normally get in computer science The BS in Computational Media at Georgia Tech is the most gender-balanced, ABET-accredited undergraduate computing degree in the United States. We use these examples to paint a picture of using creative expression to motivate interest in computing. Mark Guzdial is a Professor in the School of Interactive Computing at Georgia Tech. He is a learning scientist who focuses on computing education research. He invented the Media Computation approach to teaching introductory computing. He serves on the ACM’s Education Council, and is on the editorial boards of the “Journal of the Learning Sciences,” “ACM Transactions on Computing Education,” and “Communications of the ACM.” With his wife and colleague, Barbara Ericson, he received the 2010 ACM Karlstrom Outstanding Educator award. He was also the recipient of the 2012 IEEE Computer Society Undergraduate Teaching Award. Barbara Ericson is the Director of Computing Outreach and a Senior Research Scientist for the College of Computing at Georgia Tech. She has worked at Georgia Tech to increase the quantity and quality of secondary computing teachers and the quantity and diversity of computing students since 2004. She is currently also pursuing a Human-Centered Computing PhD at Georgia Tech. She has co-authored four books on Media Computation. She was the winner of the 2012 A. Richard Newton Educator Award. She has served on the CSTA’s Board of Directors, the Advanced Placement Computer Science Development Committee, and the NCWIT executive committee for the K-12 Alliance. After my post claiming that Georgia Tech’s Computational Media program is the most gender-balanced, ABET-accredited computing undergraduate degree program in the United States, I had several people ask, “But that’s enrollment. Do the women graduate? Do they stick with the program?” My sense was that they did, but I asked our College data person, Elijah Cameron, and he sent me the below. 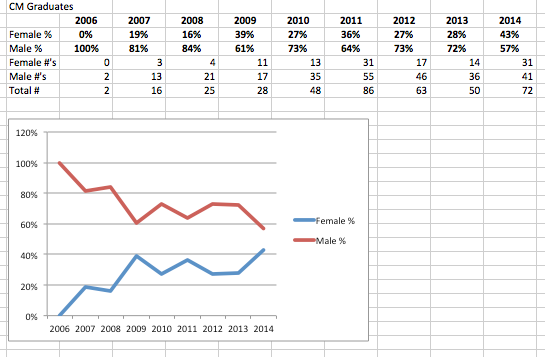 Last year, BS in Computational Media graduates were over 40% female. Pretty good.